Apogee’s innovation in the realm of mobile audio recording has been tireless. They seem to be betting that many podcasters, YouTubers and even self-recording musicians are coming to view even a rig comprising of a laptop, small audio interface and USB mic as burdensome. Being able to record pro quality audio on an iPhone or iPad is great, but without a tiny, true pro quality mic it didn’t make as much sense to transition into a micro-sized recording setup. Of course for the film/TV production crowd that has relied on lavaliers for years, this fully digital route is simply more convenient as a separate audio interface is no longer needed. Enter Apogee’s ClipMic digital and MKE 2: an entry level and high-end lavalier respectively. 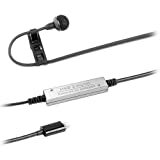 This is essentially Sennheiser’s lavaliers with a 24-bit/96 kHz converter by Apogee and lightning connector at the end. Both models have identical specs in many respects. They work with a large range of iOS devices such as iPhone 6, iPhone 6 Plus, iPad Air 2, iPad Air, iPad mini. You can record at up to a 24-bit/96 kHz sampling rate with any iOS app that allows it. The difference is the mic capsule. The ClipMic uses a Sennheiser ME 2 capsule while the MKE 2 uses, you guessed it, a MKE 2 capsule. The price gap is substantial, with the ClipMic currently retailing for $199 and the MKE 2 for over double that cost at $499. For film/TV production professionals or journalists that may set up in possibly harsh environmental conditions, the MKE 2 is the right choice due to its superior membrane. For a larger proportion comprising of podcasters, YouTubers, etc., the ClipMic will hold up just fine for general use. Now we come to the comparison you’ve likely been wondering about all along. How does the sound quality differ between the two? Make no mistake, the MKE 2 isn’t just tougher, it does indeed sound better. The ClipMic’s sound has been described as hyped in the highs or bright, while satisfactory for the low price point. The MKE 2 is no compromises mic, with richer, fuller sound and the ability to create better dimension in the sound due to better omnidirectional technology. All but the pickiest interviewers, podcasters and YouTubers should be happy with the great value and above average abilities of the ClipMic. The MKE is tough and sound-wise the omnidirectional performance takes you into its world with more detail and dimension. However in applications other than film/TV or music production those advantages wouldn’t give you as great a return and won’t be worth the price leap for many. I’m often amazed that manufacturers can price certain USB mics so low. A decade ago even on a shoestring budget you’d be looking at a few hundred for a mic and audio interface. And that is what a USB mic really is: a one-channel audio USB interface and mic built into one device. 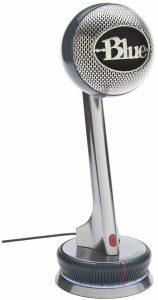 The Blue Snowball has garnered much attention due to its quirky design, versatility and incredible value. 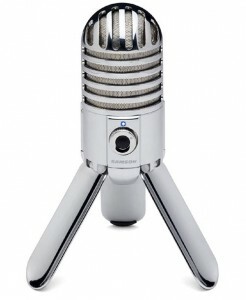 The Meteor Mic seems to be Samson’s answer to it, as it’s similarly priced and has vintage look all it’s own. Standing only 6 inches high with the legs extended, this is a good mic for your portable laptop or iPad rig. The super reflective chrome body includes a fold-back leg design; I really this appreciated for portability since you don’t have to fold and pack a stand separately. A killer feature absent from its competition is the threaded stand attachment. You’ll be able to mount it to any standard mic stand making positioning for acoustic instruments, guitar amps and percussion far more precise. Nice to see Samson thought of the needs of musicians rather than putting all focus on podcasters. Most noticeable at the front is a large headphone volume dial with a mute switch in its center. Just above is the intelligent LED light: when connected it glows blue and when muted it’s amber. The mini-USB port and 1/8” headphone jack are positioned at the rear. Most companies have remained pretty hush-hush about the size of condenser diagraph inside the casing. As a rule of thumb, the bigger the diagraph, the bigger the soundstage it can capture. Samson claims the Meteor Mic has one of the largest condenser diaphragms (25mm) of any USB mic available. Sound quality is crisp, articulate and quite full bodied when recording male voiceovers. This is rare as many USB mics are lacking in bottom-end that can be picked up. The most common pickup pattern is possible: cardioid. This means it captures sound from in front of the mic and rejects noise coming from the back. In this regard the Snowball has a leg up on the Meteor as it gives you a choice of three patterns for around the same price. Those that want something highly portable but not too tiny when set up, this is a nice compromise between a desktop mic like the Blue Yeti and the super compact Samson Go Mic. The sound has a rich character considering it’s low price tag. The retro chrome body is a little quaint and not as rugged as something like the pricier Apogee MiC, but for under $70 few could find much reason to complain. 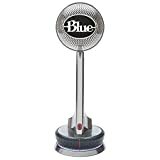 The designers at Blue are experts at injecting cool-factor into their mics. And they’ve really topped themselves with the future-retro styled Nessie. Like the fabled sea beast of Loch Ness, it has an intriguing angled neck worth admiring. It’s not done this way just for the sake of aesthetics. It’s a very practical design. Blue calls it’s headphone output “zero-latency” and I found it too indeed to be very responsive and without noticeable delay. The headphone input is hidden away at the back, directly above the mini-USB port. The base of the Nessie is a giant headphone volume dial. Just above that is a large mute button. While handy and absent from many competing mics, due to the position and size it may be prone to accidental activation. To eliminate extra time setting up, the pop filter and shockmount is built right into the mic. This is a huge plus for recording on location and helpful to beginners as there are two less items of concern to think about. Nessie’s three recording modes are different from the standard polar pattern switching you might expect. It sticks with the cardioid pattern and tunes the sound for the application. One position is optimized for rich vocals, another for detailed instruments, and a raw audio option is there for experienced producers who prefer to make adjustments in post-production. This is an interesting step toward allowing the hardware to get the right sound, rather than expecting users to find the right EQ curve via software. If you’re a beginner when it comes to recording, this is welcome, but experienced individuals may prefer the more advanced setup the Yeti provides, with it’s three polar patterns. The sound may not rival vintage tube mics but it’s definitely more than good enough for podcasting and recording demo music tracks. In the right hands you could make a hit record with the Nessie. Onboard audio processing does help achieve a serviceable voiceover sound but I prefer the Yeti for this. The real strength of the Nessie is capturing instruments and female vocals because of the character of the small capsule condenser inside. This is a great choice for budding musicians but it didn’t quite cut it for a deep male radio voice. The Nessie makes it difficult to capitalize on the proximity effect, which is speaking very close to the mic for a bass-rich sound. The swivelling head allows for some creative positioning options, which the Yeti and Snowball cannot do, so beside the uber-cool design this is what makes the Nessie stand out. I’m often asked “what is the best USB mic for Macs?” In some way it’s a misguided question since nearly any USB mic will work with Macbook Pros, Macbook Airs and iMacs alike. There is some legitimacy to this inquiry. Sure the “Audio MIDI Setup” in OS X will allow you make use a massive array of mics without the clunky drivers of ages past. However, there is one company that tailors their equipment to work with Mac devices. That company is Apogee. For years Apogee was focused on the Mac. Now that the iPhone, iPad and iPod Touch are powerful enough to be used as professional audio production devices Apogee has adapted their hardware and software to play nice in the iOS realm. So when you get an Apogee product (excluding their super high-end stuff like Symphony), it’s guaranteed to work with your newish Mac plus any additional Apple device. 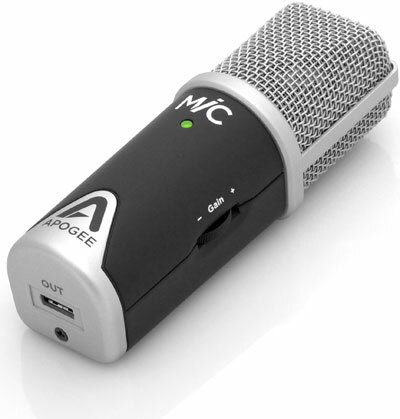 The Apogee MiC and now MiC 96k are the most Apple-friendly USB microphones out there. While you can’t take advantage of the power of their Maestro 2 software, you don’t need it, as there is only one channel of audio and the MiC has a hardware dial allowing you to change gain levels on the fly. With a clunky 30-pin or Lightning to USB adapter mics such as the Blue Yeti will also work in iOS. The MiC offers a much slicker solution as you are given a 30-pin and Lightning cable that connect to your device out of the box. This may not be a huge deal with an iPad but the adapter looks pretty absurd when plugged into a tiny iPhone 5s. 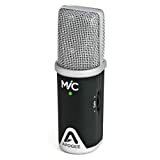 Since the MiC and MiC 96k are the most plug-and-play mics that work with Apple iOS devices, they are easy to recommend to people that prefer creating music and podcasting within the Apple ecosystem. Technically the MiC isn’t just a USB mic. It’s a 30-pin/Lightning/USB hybrid mic and if you like to keep your possibilities open, that’s pretty cool. A common complaint about USB microphones is that most only do 16-bit/44.1 KHz recording. This is CD quality and ample for streamed content. However, when working with the Blue Yeti I often found myself eyeballing cases containing XLR mics and my Apogee Duet, lusting for 24-bit goodness. Blue addressed this urge for high-definition audio by releasing the Yeti Pro. 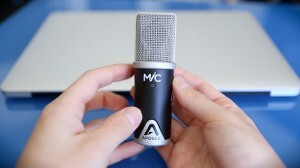 And Apogee has stepped up with the MiC 96k, a revision to the original MiC. The MiC 96k and MiC look identical on the outside. The differences are of course internal and on the spec sheet. Both allow you to record on your Mac, iPad, iPhone or iPod Touch. Like the name implies the Mic 96k allows you to set sample rates all the way up to 24-bit/96kHz. Some may be irritated that Apogee excludes Windows users but I see it as an advantage. This means their software people can focus all their attention on iOS and Mac OS X, rather than spreading themselves too thin and falling behind as new OS updates come out. I was surprised how tiny this microphone is. It measures 4.56” (115.8mm) tall x 1.52” (38.60mm) wide. It is dwarfed by the Blue Yeti, which measures almost 12” tall. Despite it’s stature this is a USB mic worth taking seriously. It features a road-worthy all metal construction. Beyond the pro level sample rates it is also equipped with Apogee’s highly regarded preamp and converter technology. Sound quality is excellent and may even surprise gear snob producers that trash talk about cheap USB mics. Experienced ears should hear a clear boost in depth when switching from 16 to 24-bit. The small size does have some tradeoffs in the sound department as expected. Due to the form factor Apogee had to use a small capsule; it sounds good but the impressively huge sound of a large diaphragm condenser mic will defiantly not be replaced by it. Functionality is simple and stripped down although if offers more hardware-based control than the basic Audio-Technica offerings. Those that prefer hardware controls will like this gain control dial on the side. This gives you up to 40 dB of gain. The indicator light is unique and a pretty nifty detail. This lets you know if the device is ready to record or if the gain is set too high and the signal is clipping. For podcasters and musicians that record themselves, the red status light to denote clipping is useful indeed. And thanks to the dial you can quickly make adjustments without having to touch your Apple device. One disadvantage to this mic is the lack of different polar patterns. It is configured to record directly in front of the mic (cardioid) only. While this is fine for the vast majority of applications it’s fun to experiment with omnidirectional and bi-directional settings. Blue products give you the ability to do this, even with the modest Snowball. This could be the perfect mic for doing high-quality field recordings with an iPhone. If you need an extremely portable mic that does 24-bit the choice at this point is a no-brainer. This is the only microphone out there that checks these two boxes. Copyright © 2019 USB Microphones. Powered by WordPress and Themelia.